Cisco's Red Dot award roll underscores the company's attention to detail and validates their approach to providing a delightfully simple user experience. Following on its Best of Enterprise Connect 2017 win for the Spark Board 55, Cisco has earned recognition from Red Dot, receiving the "Best of the Best" award for the product's "extraordinary, innovative design." While this year's winners include many well-known consumer brands such as Bose, Apple, Sony, and GoPro, Cisco's wins stand out to me as particularly interesting, indicative of the tremendous success the company's Collaboration business unit has had in recent years. In total, Cisco received five Red Dot awards (the four other awards being one tier down from the Best of the Best), for its recently announced Room Kit (see, "Cisco Beefs Up Spark Ecosystem") and other Cisco Spark products. It seems Red Dot awards have become the norm at Cisco, seeing as how the company has now won 13 since 2012. Prior to 2012, Cisco had only won three in its history -- and those were from Tandberg, Flip camera, and LinkSys -- so in a sense, Cisco had acquired those Red Dots, or at a minimum, didn't get in the way of the design teams from those companies. Winning these awards certainly isn't easy. For the 2017 Red Dot award for product design, more than 5,500 entries were made by manufacturers and designers from 54 countries -- from what I understand, a record for Red Dot. Winning the awards is validation of Cisco's claims that its products are dead simple to use and provide an experience that will "delight the user." The flurry of Red Dot awards for the collaboration business unit at Cisco coincided with the revenue rebound for the group. Cisco Collaboration has had a tremendous run of late, posting somewhere in the neighborhood of eight consecutive quarters of growth despite having shifted to a deferred revenue model. Prior to that, Cisco Collaboration had experienced multiple years of revenue decline. This begs the question: Is there a correlation between Cisco's run of Red Dots and the reversal of fortunes for the business unit? I believe there is. In this highly consumerized world, workers expect -- sometimes even demand -- tools that are easy to use. Tools that are get used a lot, and ones that aren't sit there and collect dust. The culture of making products dead simple to use (versus just simple) came to Cisco via Rowan Trollope, who joined the company to lead the Collaboration business in 2012, and now holds the title of SVP and GM of IoT and Applications. I recall one of my first conversations with him, which gave me some insight into how he thinks. He showed me a WebEx invitation and asked me rhetorically why he had to scroll to the bottom to find the link to join. Today, that link is a big button at the top that says something to the effect of "click here to join." The old way was easy, just click a link; but the new way is dead simple. I also remember talking to members of his team when he first joined Cisco and they seemed genuinely frazzled and told me that he drives them so hard. I'm sure part of that was having an understanding of what was expected now versus before. Based on the number of awards Cisco has won and the rate at which products are being released, it appears the whole team now has a clear understanding of what "dead simple" means. Cisco's Red Dot awards and related revenue rebound is a good lesson for the rest of the industry. I get briefed on products every week, and almost all vendors describe "user experience" as great technical quality. 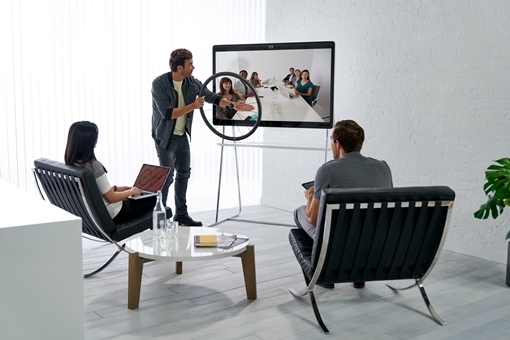 I often hear things like, "We now support 4K video," or, "This endpoint has been optimized for huddle rooms." The technical requirements are certainly valid but should be thought of as table stakes, and the innovation should be focused on removing as many barriers to usage as possible. For video, remote controls aren't simple. If a user needs to pick up a remote to change the viewing angle or zoom the camera, they won't do it. Cisco's Spark Board and SpeakerTrack technology is built on the concept that the camera should follow the users and adjust automatically, as are Polycom's Eagle Eye cameras. Microsoft is totally missing the mark on its room systems by not having a configuration that includes Eagle Eye in it. If it's going to be competitive in that space, Eagle Eye seems like a no brainer. Manual integration never works. If the worker needs to be the integration point between different systems, the solution will fail. A good example of this is how Apple won the MP3 wars. Other MP3 players required the user to download the music, put it in the proper directory, and then manually sync it. Apple had a fully integrated experience that was initiated with a single click of the mouse. Each step may seem trivial, but when several are tied together it wastes time and frustrates users. I see this all the time with remote meetings where the Web conferencing tool and audio bridge are separate. Again, each one may be simple, but it creates a scenario where the host of the call is constantly asking, "Who just joined the bridge?" or "Can everyone please mute if you're not speaking?" Those problems should not exist today. No one wants to use cables to connect. I can't tell you how many times I've gone into a conference room and no one knows where the monitor cable is, or the person with the MacBook forgot the dongle, or the HDMI cable isn't working. There are so many ways to connect via wireless today, it's ridiculous that conference rooms still have boxes of cables in them that people have to sift through to find the right one. The systems need to be "executive" simple to use. Many products have non-intuitive interfaces or other things that make us scratch our heads because they were designed and tested by engineers. The goal isn't to have an engineer rave about how easy something is to use. After all, many of them live in some sort of cryptic command line interface so anything that's not that seems easy. The best way to test a product is to see if the corporate executive, who normally has his or her admin set up the call or meeting, can use it. These executives can use tablets and mobile devices, so why not UC technology? Use words people understand. It baffles me when I see technology products that have nomenclature that only technical people understand. The best example of this is the old "Flash" button on a phone. Sure if you work in telecom, the concept of "Hook flash" is simple, but average users have no idea what that means. Mobile devices say "add a call," and then "merge call," which are a lot easier to understand than Flash. The UC industry is filled with vendors that make great products, but the mission needs to be building great experiences. In the competitive digital era, that will make the difference between being a market leader and fighting for survival. Products that are simple to use are often the most complex under the covers. I know vendors love to show off their engineering talent, so focus it in the right area, and then show off the innovation.